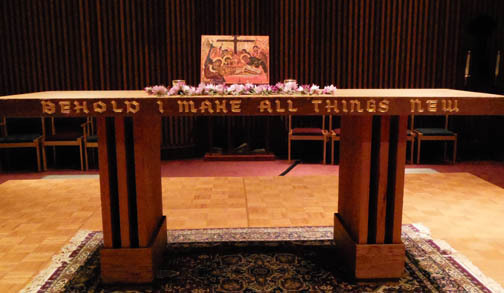 Worship is at the heart of our life together, and Episcopal worship is rich in symbolism and tradition. At the same time, it is a contemporary expression of our belief and faith in a Living God who is present and accessible in material and ordinary things. The Church is first and foremost a worshipping community. Although we can worship God privately, Christian worship is something that we do together, and gathering for corporate worship is at the heart of Christian life. In and through it we unite ourselves with others to praise God, hear God’s Word, offer prayer, and celebrate the sacraments. Episcopal worship has its roots in the ancient Church which, in turn, based its liturgy on ancient Jewish worship customs. Following Jesus command to “do this in remembrance of me,” the first Christians gathered for prayer, Scripture study, offering and a shared meal. These elements continue to form the foundation of our Sunday worship. The Episcopal Church is distinctive from other Christian traditions in that it finds its identity in what its members do together (prayer and worship) rather than in its doctrine. We are united with others throughout the country and the world through our common worship and liturgy. Worship in the Episcopal Church is prescribed by the Book of Common Prayer. Not only does the Book of Common Prayer determine our public worship, it is also the source and statement of much of our belief. This is because the way we talk to God determines how we talk about God. In other words, what we pray expresses what we believe. The Prayer Book provides structure and commonality of prayer while allowing flexibility for adaptation to customs, style, needs and expression of a particular community. Episcopal worship involves both Word and Sacrament, and can be divided into two main parts: The Word of God and The Holy Communion. The first part of the worship service focuses on the Word of God. In it we hear readings from the Bible (also called “The Scriptures”), including the Old and New Testaments and the Gospel. (The readings follow a three-year cycle.) The sermon helps us to understand the Scriptures and apply them to our own life and time. This part of the liturgy also includes the Prayers of the People. At Church of the Resurrection these prayers are usually written by our deacon so that they reflect current world events as well as the life and concerns of this community. The Holy Eucharist, or Holy Communion, is at the heart of Episcopal worship. We believe that God works in our lives through ordinary, material things. Sacraments, then, are the outward signs of God’s grace. In the Eucharist, these signs are the Communion bread and wine. At Jesus’ last meal with his disciples, he took bread, blessed, broke and gave it to them and said “This is my body… this is my blood.” He also instructed them to “do this in remembrance of me.” When we celebrate Holy Communion, we are sharing a meal. We thank God for the ways that God has acted in history, we offer bread, wine and ourselves to God to be transformed into the Body of Christ, and in receiving the bread and wine we receive God’s grace. We believe that, by God’s action, and in a mystery beyond our knowing, Jesus is present in the gifts of bread and wine. After we have been with the Body and Blood of Christ, we are sent out into the world to do God’s work. Our worship continues by our word and action in our daily life.